There are special and unique places where each and every corner seems to be enchanted. One of these places is the Son Mesquida Estate, in Algaida, in the heart of Mallorca. 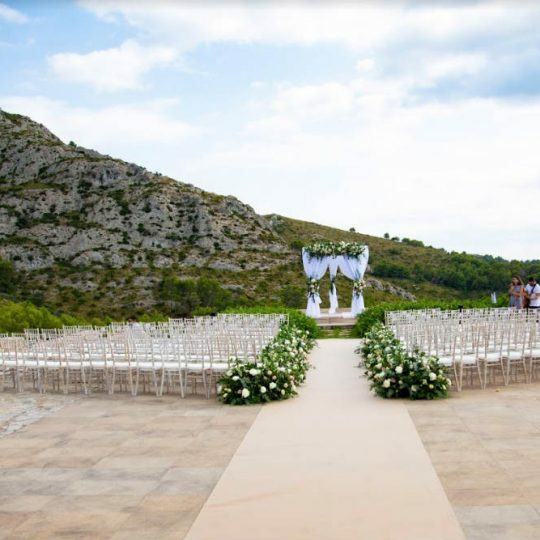 It is undoubtedly the perfect estate at which to hold any kind of wedding or celebratory event, since it maintains the style of typical Mallorcan buildings but adapted to the needs of the XXI Century. It boasts all amenities to make the most important day of your life just as special as you dreamed it would be. This was the perfect setting for Margalida and Jaume’s wedding. The decoration was full of contrasts and a variety of styles. Different types of chairs were used for the bride and groom to say “I do”, which gave a fun and original touch to the setting. Also, to differentiate the tables, the names of bands or singers that influenced the couple the most, were used. Touches of wood were seen here and there and the centrepieces were baskets filled with aromatic herbs such as mint, jasmine or basil with a touch of white flowers in the centre, to give an air of purity to the design. Overall, there was a fresh, Mediterranean feel to the decoration which gave a special aroma to the ambience. As always, our catering staff were delighted to have been part of this special day. Once more, our cuisine was a reflection of our island, the Mediterranean and the summer. Cool, light dishes full of traditional flavour and made from top-quality natural products, were served. 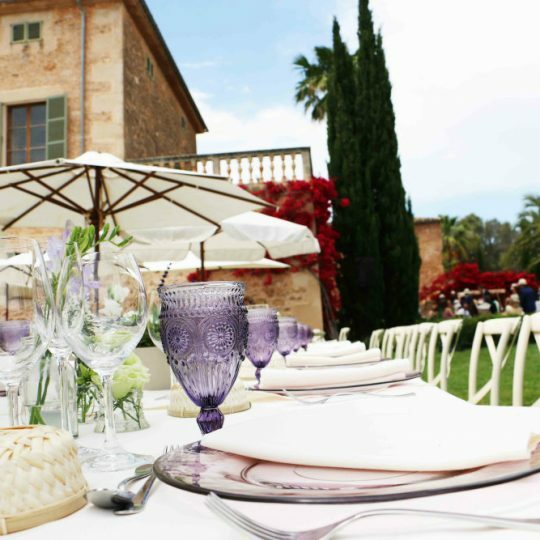 In all, the professional and attentive service we provide means that we continue to consolidate our position as a benchmark catering service in Mallorca, wedding after wedding, event after event. Mallorca weddings. Goodbye June, Hello July!